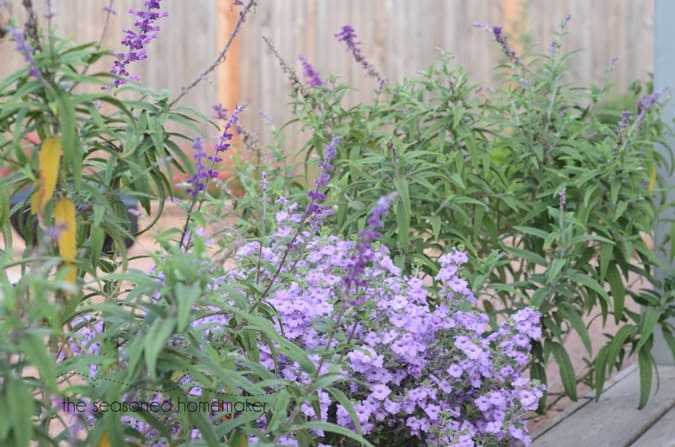 If you are a regular reader then the name of this post should be, Backyard Landscaping Update: Fall 2014. 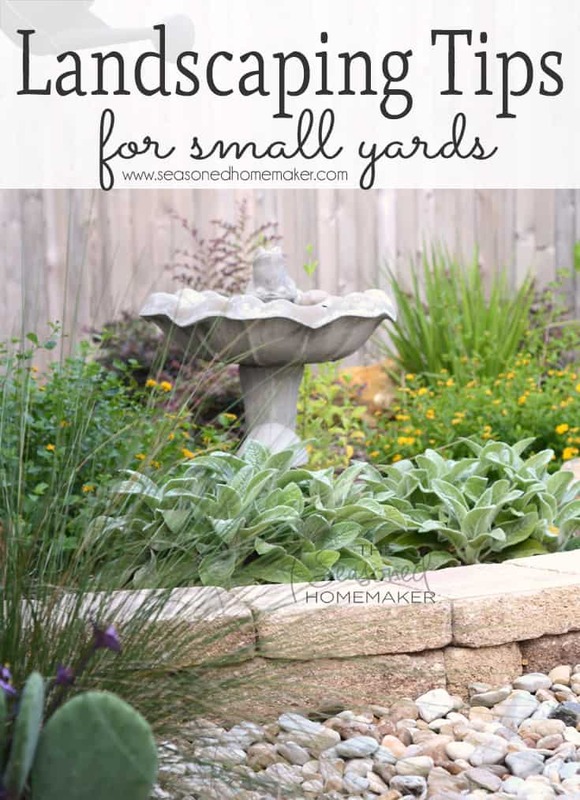 For the rest of you this is officially called Landscaping Tips for Small Yards because we have learned so much through the process of creating a landscape completely from scratch. 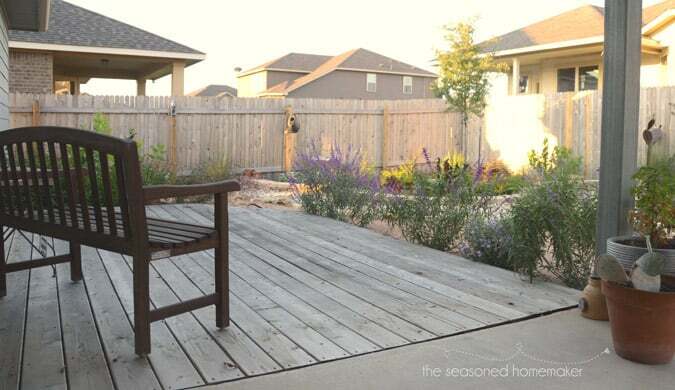 Catch up on our Small Backyard Landscape progress and process. Now that the basics are covered I want to share Six Landscaping Tips for putting together a beautiful landscape. 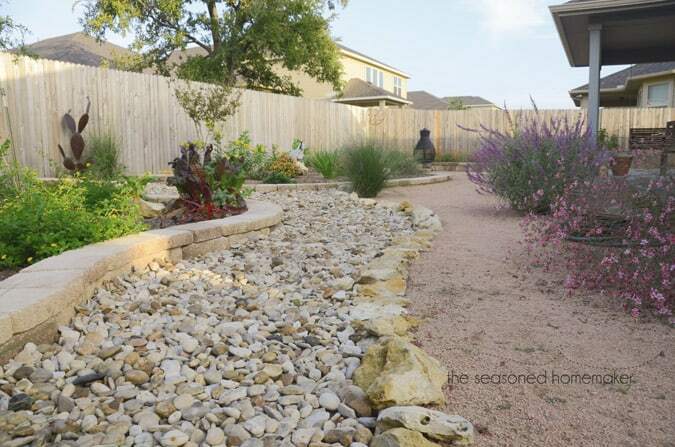 Even if you don’t live in a dry climate like Central Texas, if you apply these tips to your landscape you will have beautiful results. You have to have a vision for what your landscape will look and feel like. You can dream it up or you can draw inspiration from a variety of choices. For me there are two places that I’ve drawn my inspiration. The Lady Bird Johnson Wildflower Center in Austin, TX and the San Antonio Botanical Gardens in San Antonio, Texas. Both of these are a short distance from my home and they showcase native plants in beautiful settings. With loads of inspiration and a little experience we created our vision and this is what it included. Dry creek bed for drainage because the lots behind us were higher. Not addressing this would mean ponds and wetlands in our yard. Not good. An area for a fire pit because we don’t have a fireplace inside our house. Large beds so I could integrate vegetables rather than a formal vegetable garden (like my last house). When planning any landscape you need to think about how it will feel, and some of that feeling should come with color. Think about how the colors will interact with the overall design of your landscape. Choose colors you want to see when you look out your windows. If you think about how much color affects mood then apply this thought to a landscape. For example, a Japanese garden contains certain colors in order to evoke a sense of peace. On the other hand, a true butterfly garden with all sorts of colorful plants will bring a variety of wildlife, which adds its own brand of color. For my small backyard I have intentionally planted these two plants because they have grayish leaves and purple blooms. When they are clustered together they have a very calming effect. 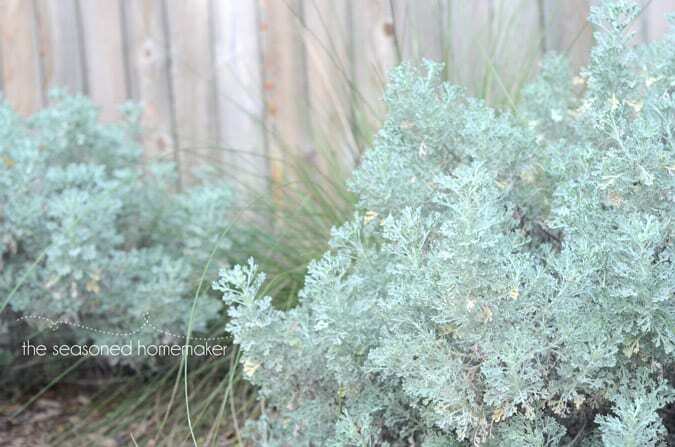 I also continued the grayish-blue theme by I adding some Artemisia and Lamb’s Ear. 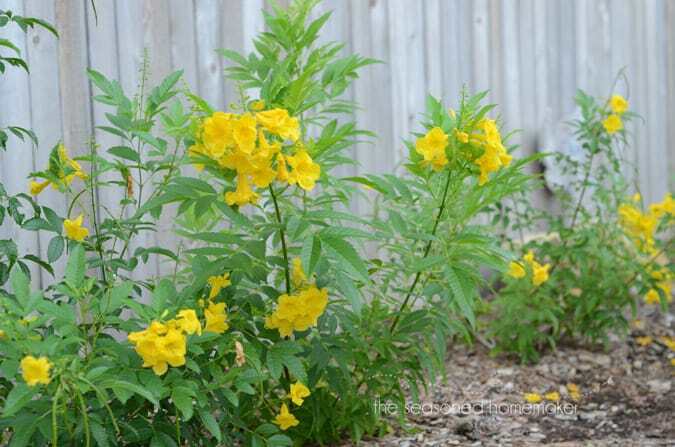 These three plantings are in different parts of the yard but your eye is always drawn to them. It causes you to sweep your eyes across the entire landscape in order to connect these colors. This bright, showy plant insures that every time I look out my back window I will see a beautiful pop of color. 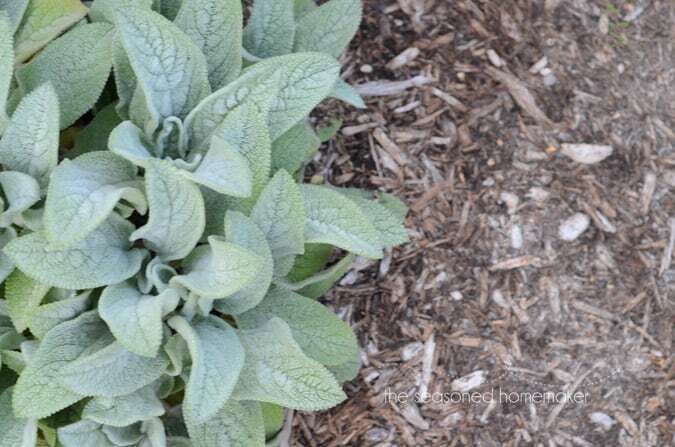 You’ve seen the Lamb’s Ear above which is a perfect example of texture. It’s soft and fuzzy, inviting you touch it. The same is true for foxtail ferns which can never be resisted. When adding texture to any landscape mix a lot of different textures for interest. Look for plants that move in the breeze, plants with interesting bark, plants that invite touch. Blending textures is one way to get interest in the landscape. Include a balance of fine textured plants alongside courser textured plants. Before you know it, there will be harmony in the garden. Notice how different the two leaf shapes are in these different plants. 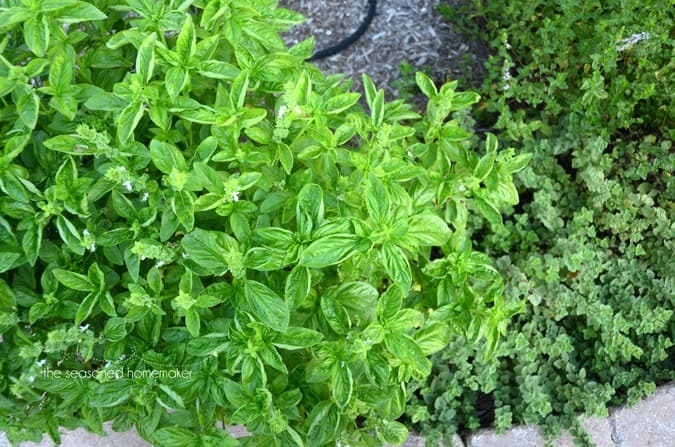 Placing the larger leaf basil (left) next to oregano (bottom, right) adds texture and variety to my herb garden. A deck is a great example of texture. It’s made from wood (cedar, in our case) which is a natural element. When it is incorporated into the landscape, it adds a texture completely different from the plant materials while still remaining familiar. 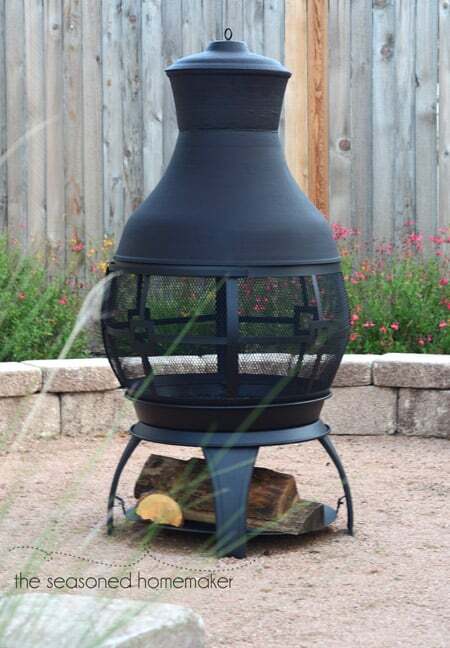 Anchor pieces like this cast iron chiminea bring texture into the garden as a stand-alone feature. Ever been mesmerized by a field of wheat moving in the breeze? There is something about movement in the landscape that we are drawn towards. In my backyard I have planted grasses and a willow-y shrub to insure movement. The plant with the small pink flowers is a feature plant called Whirling Guara. Like its name implies, it is never static. If I had a larger backyard I would have more of them planted. Because of my yard’s size, I have one. It is enough of a feature to add plenty of movement. Grasses are really a great go-to plant for adding movement. In our landscape we’ve integrated grasses into every bed. That means that everywhere your eye moves there is movement. As you scan through the photo below notice that there are wispy grasses and stiff grasses. Texture AND movement. We don’t have a water feature in our yard. Instead, we have a dry creek bed that curves. This creates the feel of movement without having the element of water included. Notice all of the curves in the stonework. This also creates an element of movement. Who wants to take their landscape too seriously. 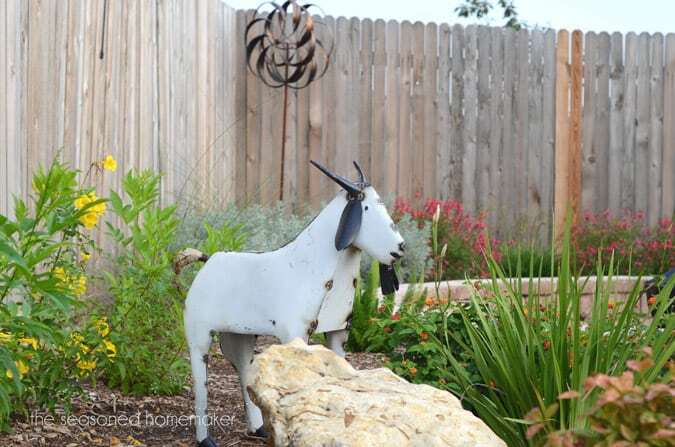 Adding a touch of whimsy into a landscape will add humor and interest. Just don’t go overboard. I have a rule about this: A little whimsy goes a long way. Keep it tasteful. 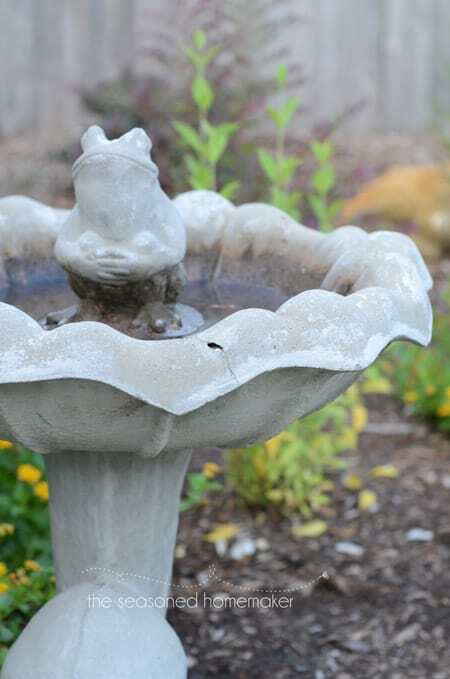 See how Mr. Frog quietly guards the bird bath. This is my goat, Euphemia (Phemie, for short) who invites all guests into the garden. Children love her and adults smile. I’ve placed her near a rock because it seems likely for a goat to be climbing a rock. When adding whimsical pieces, keep it in line with the overall scale of your landscape and small pieces can tastefully embellish your yard. Unity in the landscape is elemental. It’s what brings the whole design together and holds your attention. The final thing that ties any landscape together is unity. You have to have unity or you don’t really have a landscape. 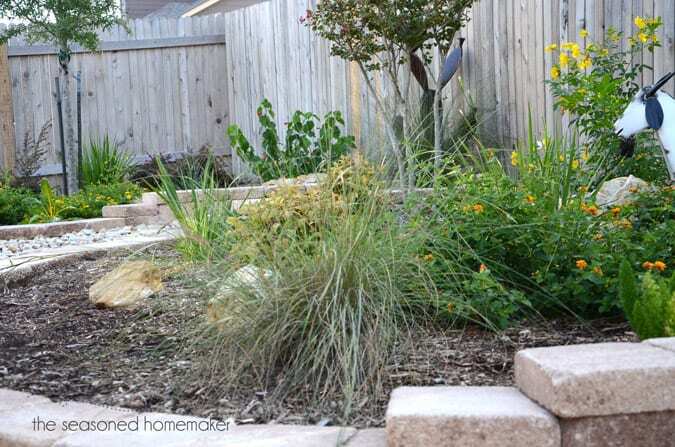 In our small backyard landscape we’ve achieved unity by sticking to a xeriscape theme. This theme uses rocks and water-wise plants as fundamental elements. Even our path is made from decomposed granite which continues the theme. All of these elements at some place touch. 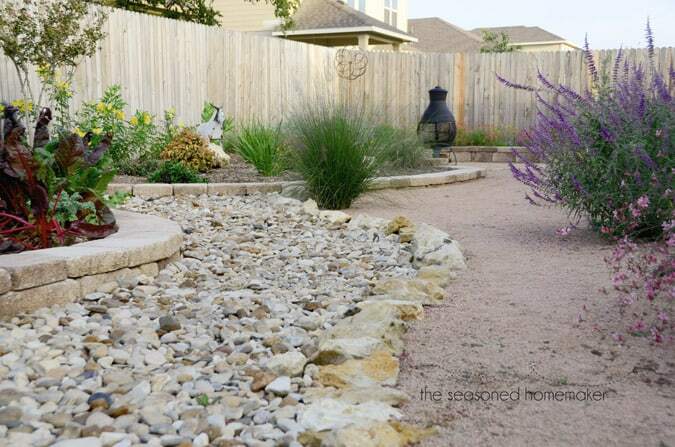 The stones meet the river rocks or the decomposed granite touches the stone wall. This is what creates repetition and unity. You ultimately create unity in any landscape when you connect all of the dots: Vision, Color, Texture, Movement, and Whimsey. Put them all together and keep it to scale and you will have created a landscape fit for any small yard. Love the little metal goat. Great landscaping ideas, thank you. How beautiful. Thanks for sharing. I have been looking for landscaping ideas. We recently moved into a new home in the Houston area and it desperately needs work. You’ve given me some great ideas. Thank you. Wonderful tips! I especially love the planning aspect. That is the hardest for me. It’s a blank slate and there are so many possibilities. If you’re interested in linking up, we are hosting Show Me Saturday and would love to help you spread the word. Hoping you have an awesome weekend! Many thanks for the great ideas. I’ll try to incorporate some of them as I gradually redo my back yard. Mine has a bit of an Asian feel as does the front with my teahouse (also my inside decor). Love the grasses, I have papyrus & another unnamed grass. Want to do away completely with the weedy lawn in back yard, I like your xerioscape plan. These are GREAT tips. We have a huge yard and don’t know what to do with it. This will be helpful when Spring comes back around. 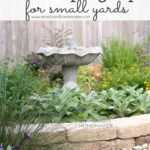 wow, what a great yard and great tips. 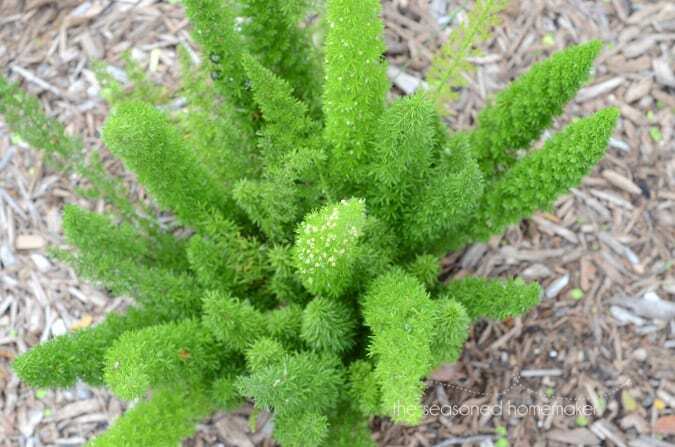 foxtail fern, is that what that is? i thought it was asparagus fern. i love both now! 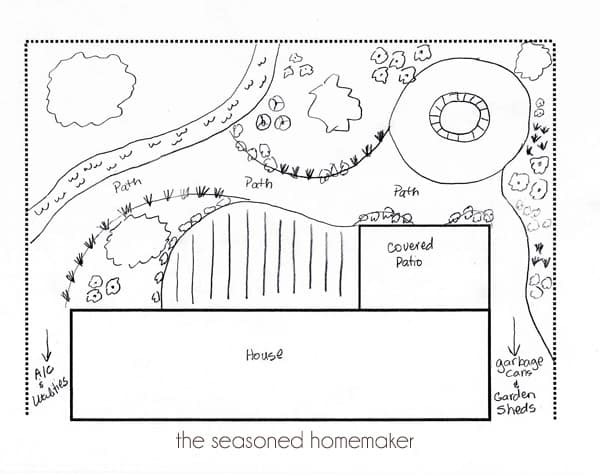 Really like your yard plan..I also have a small yard .. will be busy next spring..
Looks amazing! 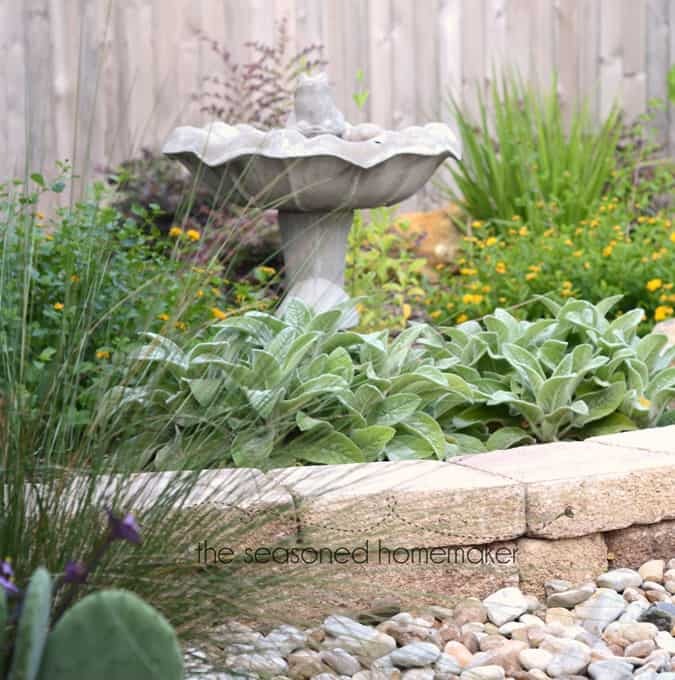 I’ve become more interested in xeriscaping given the many years of drought conditions and our lack of a sprinkler system, but my husband won’t go for it! Your backyard is absolutely beautiful! I love the dry creek bed and the lovely colors and textures. 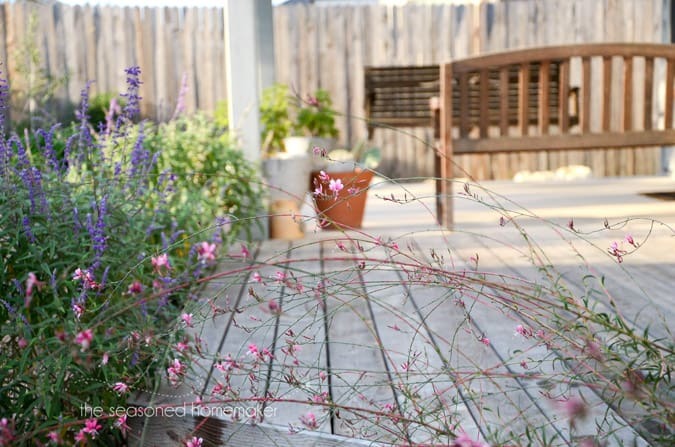 I’m following you now via Bloglovin and look forward to see more of your beautiful yard! I have a small backyard I’ve been transforming into a prayer garden the last three years. We have similar tastes– I like the grays and blues, I have many of the same plants you have–even the same chiminea! It’s really hard choosing the right plants for the right locations and pulling the design together–you have some great suggestions. I wish the view over my fence was beautiful greenery instead of roofs –I’m trying to screen the view as much as possible but don’t have the room for screening plants all around, so I’m trying to plant evergreen shrubs I can prune into small trees that allow for standing or sitting underneath. 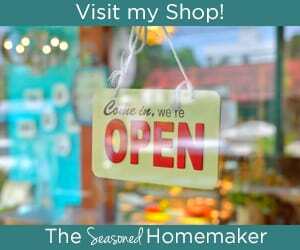 Best with your blog and garden! That’s true that there’s something about movement in plants that is relaxing to watch. I should look into that plant with the small pink flowers. It looks pretty. Does it need a lot of water to thrive? I’m wanting to remodel my yard, but the problem is is that I don’t have a very big yard at all. It’s actually pretty small, so I don’t know what to do with it. That being said, I really appreciate you sharing some insight with me about this and letting me know about some designs that I could take a look at to make my yard look better. I’ll be sure to run by these and see which one would look best. Thanks for all your help. I actually love how you just used loose rocks for the path through the yard. Your overall design is beautiful and unique! We want to do a pond rather than a fountain but other than that, our design plan is very similar! I would love to get your input on some of the ideas that we have! I’ll have to keep the types of flowers that you used in mind; I love those colors. Do you mind if I ask, where did you get that metal goat that can be seen in the photos? It looks fantastic! I got Euphemia (my metal goat) at HEB (a Texas grocery chain) in Austin. Most of the metal yard art is made in Mexico and is very inexpensive. How could I make my yard look nice? There are a lot of ideas but they cost money and for now we rent and my husband wants to spend nothing on anything. Small garden boxes are simple and inexpensive. Also, check at thrift stores for unusual items that can become containers. Then add either your favorite plants. The best thing about having a smaller space is you can put a little more money into it to really make it look incredible! I agree that choosing the right colors can help your landscaping look great. I can see how anyone who wants to work on their landscape would need to pick a couple of colors that they like to make the landscape have a good coloration but at the same time keeping it simple. I will definitely make sure to talk to my landscape designer about this, I want my landscape to look great. I appreciate the tips. I like that you said that color affects mood. If I was going to do landscaping in my yard I would want to know that I am able to pick the color scheme. The color scheme I think would affect how people would interact in my yard, but I would want to ask a professional about this first. I liked when you talked about having a vision when working on your landscape. It makes sense that doing this can help you make sure you have a plan to help you get the best our of your space. I can see that making sure you take your time to consult with a professional you trust can help you get the results and design you want to have. Did you install a watering system into your backyard? No, with Xeriscape plants there is very little need for water. Plus, we live in an area with high watering restrictions. Thanks for the tips for landscaping small yards! My wife and I have a tiny yard, but we want to make it look as beautiful as possible. I like that you mentioned to choose two or three colors you like and design your landscape around that. We will sit down and try and do this together! I love your tip of adding something whimsical to the landscape for an extra charm. I’m planning on improving my yards landscape, and I’d make sure to relay this idea to my future landscape contractors. Thanks for sharing!